We’re totally changing things up today! And by “changing things up,” I mean we’re drinking wine. Oops? I’ve never actually thought about posting wine pairings on this here internet website url, so when the fine folks at Noble Vines wrote, asking if I’d like to sample a couple of wines and possibly pair them with food for you, I was like duhyesgimmerightnowomgyes. But I wasn’t dramatic or anything. So! We’re gonna keep it super simple with two recipes and two wines. We’ve got the Noble Vines 2013 446 Chardonnay (which comes from Monterey, CA. I’m always interested in that kind of stuff. Are you? Never mind.) and Noble Vines 337 2013 Cabernet Sauvignon (which actually comes from Lodi, CA). WHERE IS THIS LODI? I have no idea but I need to go there. Now, I’m normally more of a crisp, grassy Sauvignon Blanc (and rosé, duh) type of gal, but knowing I was getting a Chardonnay, I knew I had no other single choice in life than to throw balls to the walls and pair it with something exorbitantly buttery, ridiculously decadent, insanely succulent, ludicrously rich and slap-ya-face-off-to-the-ground-and-back worthy. But like, the big ones. The dry ones. The ones that send you to bed early in a weeping rage for 17 hours because you cannot rightly deal with the luxurious joyride your mouth just encountered. If you’ve never seared scallops, please rethink the direction of your life and make it happen. For the sake of your relationships, your well being, and the utter bliss that life has to offer, MAKE IT HAPPEN. And on top of that, it’s actually quite simple! No, for real, stay with me here. 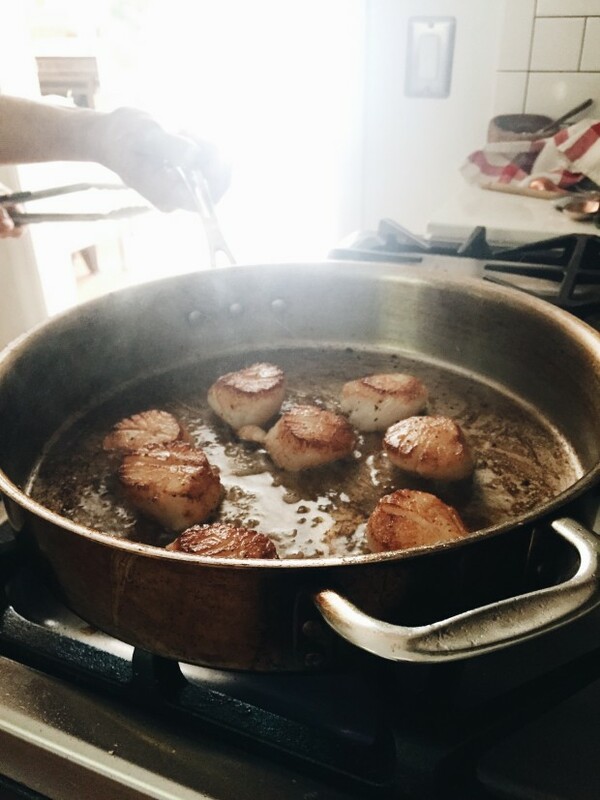 You’ll pat the scallops very dry, throw them in a hot pan with butter and oil, sear on one side for seriously about a minute. Flip and sear another thirty seconds to a minute. You want a beautiful sear on one side, and allllmost cooked through. Not entirely though! The best scallops are the ones that are still a kiss of rare on the inside. Dear infant cherubs I can barely even sit still just thinking about it. I wanted to bring the Chardonnay into the recipe, just to incorporate the sipping (ahem, gulping) taste with the eating tastes. Which is an awkward thing to say, but you know who you’re dealing with. So, after I wilted a bunk ton of winter greens (kale and arugula for life), I seared the scallops. Then after THAT, I made a crazy simple lemon butter wine sauce to drizzle over the finished meal. It sounds laborious, but it’s seriously just a matter of a few swirls of your pan, a little simmer simmer, and that is IT. 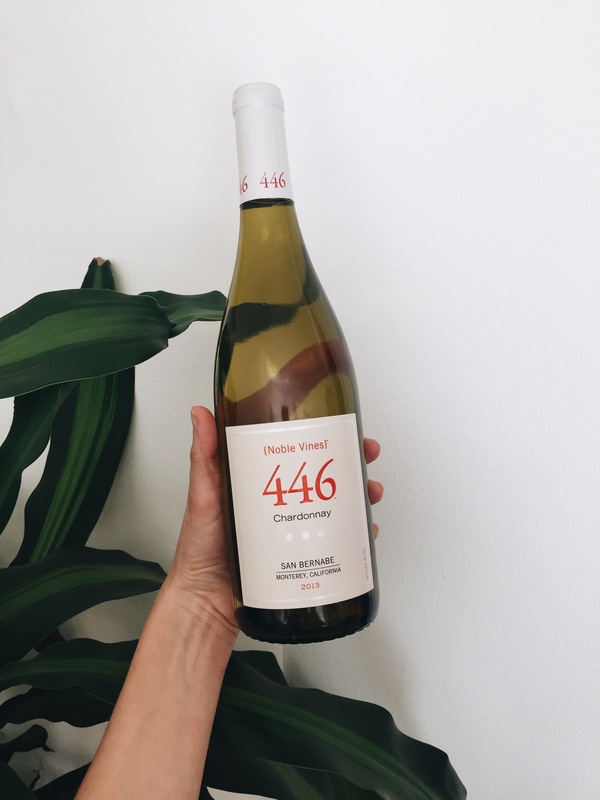 And as far as the tasting notes go for the Noble Vines 446 Chard, holy hallelujah. It’s medium bodied, nothing too strong or overpowering. But it also has hints of fruits, like coconut and peaches, and even spicy vanilla! Isn’t that neat? I thought that was neat. It’s insane with scallops, I’m telling you. Heat the oil in a large skillet over medium-high. Add the garlic and sauté for 30 seconds. Add the arugula and kale; toss to wilt. Season with a small pinch of salt. Remove from the skillet. Back in the pan, add another Tbs. oil and 2 Tbs. butter. Once the butter has melted, add the scallops. Sear for a minute and a half; flip and sear another minute. You should see a nice seary crust on one side. Remove the scallops and set aside. Back in the pan, add the remaining Tbs. of butter, the wine and lemon juice. Whisk and simmer until reduced by half. Taste and add a tiny pinch of salt, if needed! 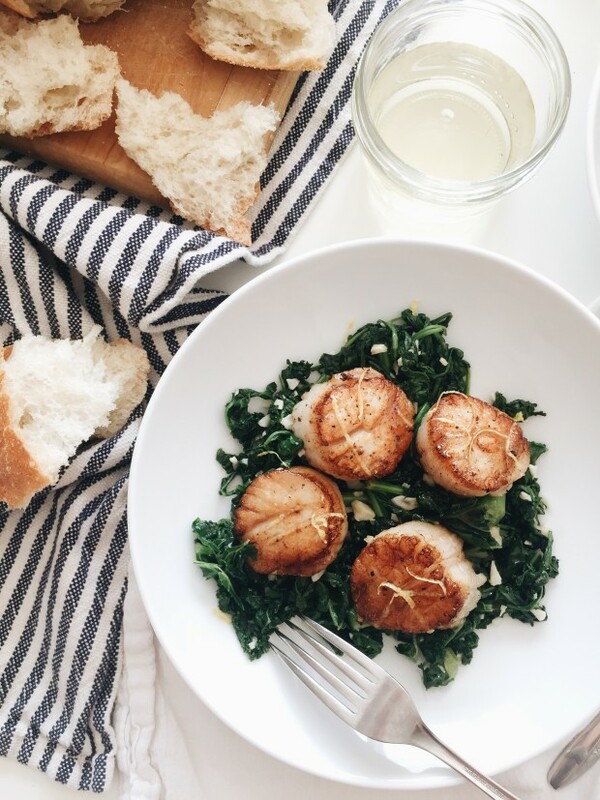 Serve the scallops over a mound of wilted greens, finished with a good drizzle of the wine sauce. Add lemon zest as a garnish if you want! You should want. Now, onto the red, baby. I have to tell you something. I have theee most porous teeth. The MOMENT I drink red wine I look like I just ate a live baby goat. Like really, all of my nighttime direct snaps with my friend, I’m all, “IGNORE MY EXORCIST TEETH.” She drinks the red, too, you see. We’ve come to just accept that this is our vampire feeding way of life. What was I saying? Oh yes, tacos! So this next recipe is also insano simple, and paired with a DELICIOUS Cab. I call it Cab to sound cool. Did it work? 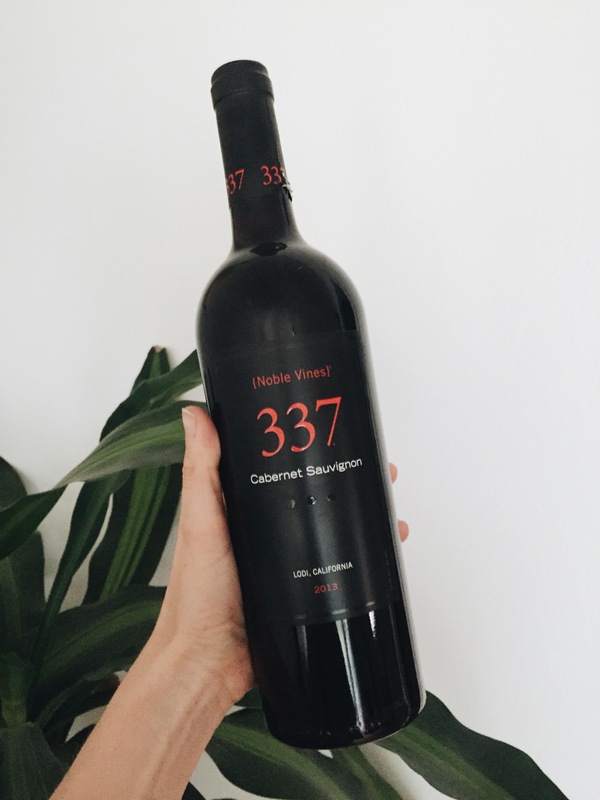 Okay first, a little about this Noble Vines 337. I love reds because while fruity at times, they often lend themselves to spicier tones. Super wintery and holiday-y and share the entire bottle-y. This Cab in particular has notes of fresh herbs and freaking COFFEE. It’s basically all I need in this world. 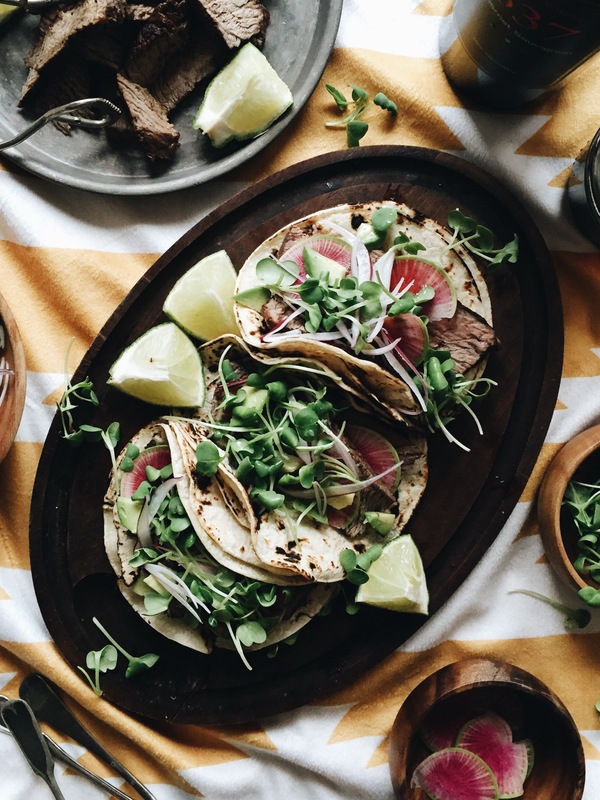 You marinate it for a little or a lot bit, grill or sear it to your liking, slice and slide some strips (I like alliteration) into some toasted corn tortillas. Then PILE on whatever you dig. I went with watermelon radishes (they’re gorgeous! ), thinly sliced red onion, diced avocado, micro greens and LOTS of lime juice. Just pile it on, baes. Keep piling until you can no longer see through your blubber. And obviously serve it with a mammoth pour of red wine. 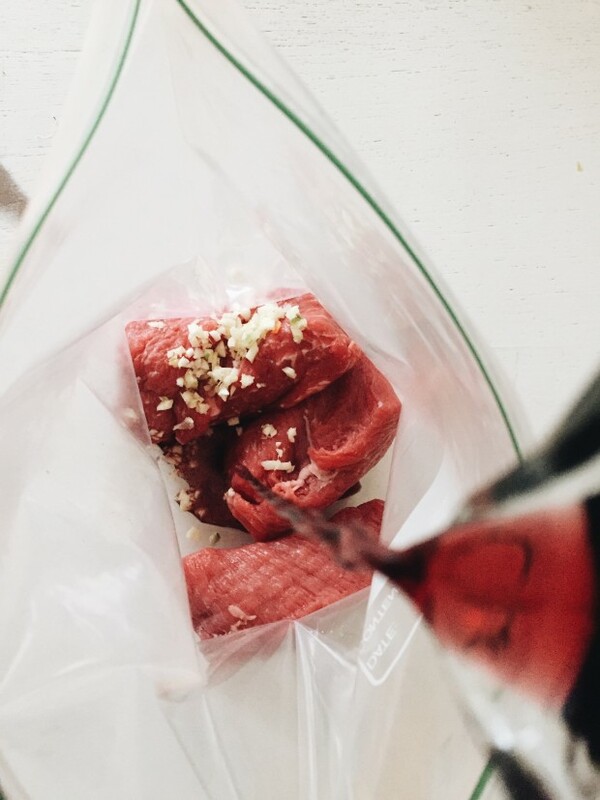 In a large baggie, place the steak, garlic, wine and salt. Seal the bag and rub the steak, getting it all coated with the wine marinade. Chill for at least two hours. Once marinated, remove the steak from the baggie and lightly pat dry. Heat the oil in a large skillet over medium-high. Add the steak and sear on both sides to your preferred doneness. I really love medium rare, but overcooked mine this time around, because the meat was thicker than normal and I got scared. Let the meat rest for about 10 minutes, and thinly slice. Then you make tacos! If you have a gas stove, lightly char the tortillas over the open flame. This makes ALL the difference in the world, I am seriously telling you. 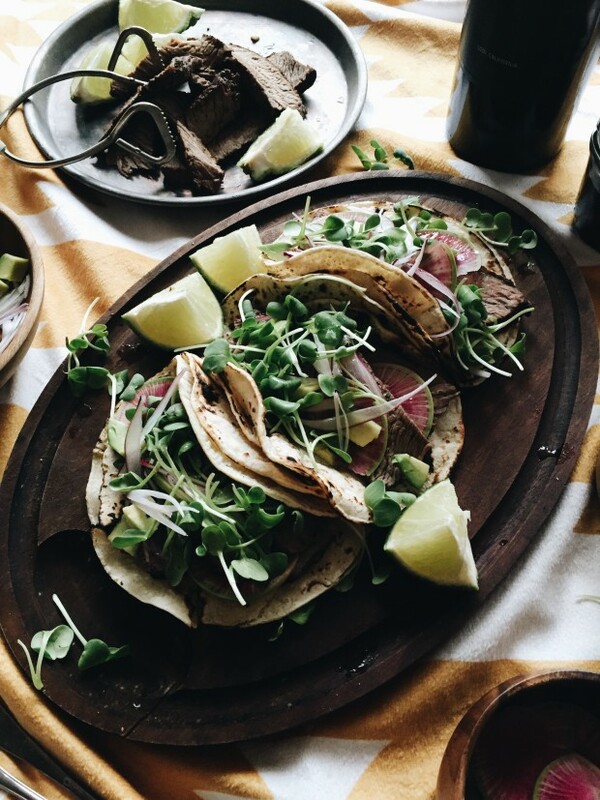 Then top with sliced steak, red onion, avocado, radishes, micro greens and a goooood squeeze of lime juice. Inhale. Massive thanks to the peeps at Noble Vines for hooking me up with some much needed Mama juice. They made this post happen, but of course, as always, opinions belong to moi. And if you want to try out the wine, they’re actually sold in a lot of grocery stores, like HEB, Kroger, Safeway and Publix. And also little indie wine shops! Annnnd you can order it here. Boom. 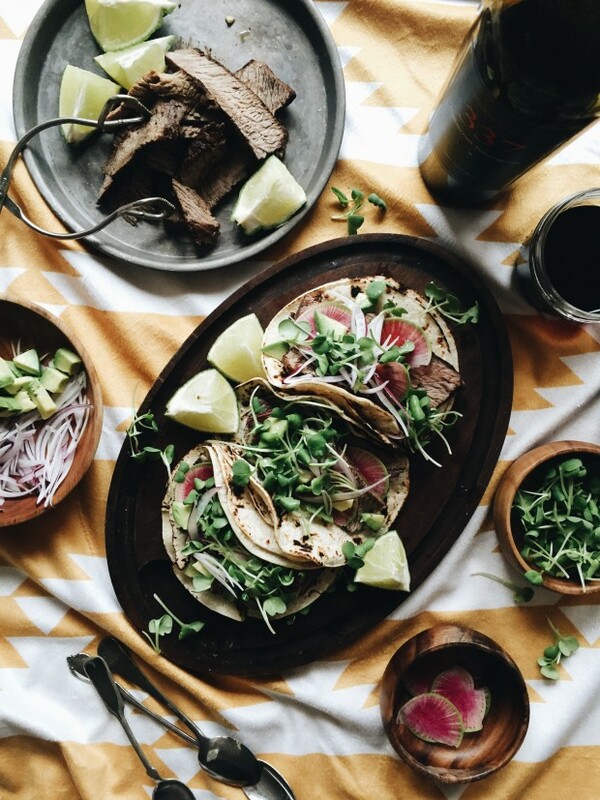 OKAY, I’m dying to know – do you have a specific favorite wine that you you pair with a particular dish? I need to know these goods to stay alive and fruitful in this world, you know. Reading about those scallops made me cry a little bit. Also....wine. Yes please. Those scallops look amazing! I tend to prefer red (except at weddings/events so I don't spill or have embarrassing red teeth). Noble Vines Pinot Noir is one of my go-to's! Ok, I just want to eat all of this, all the time, forever. First I was like "Butter plus wine plus scallops? This is my favorite!" But then I was like "Garlic plus steak plus wine? This is my favorite!" I'm normally a white wine drinker (Pinot Gris FTW) but I like a red if I'm eating steak or something. Syrah or Cab or Cotes du Rhone BUT never Merlot! 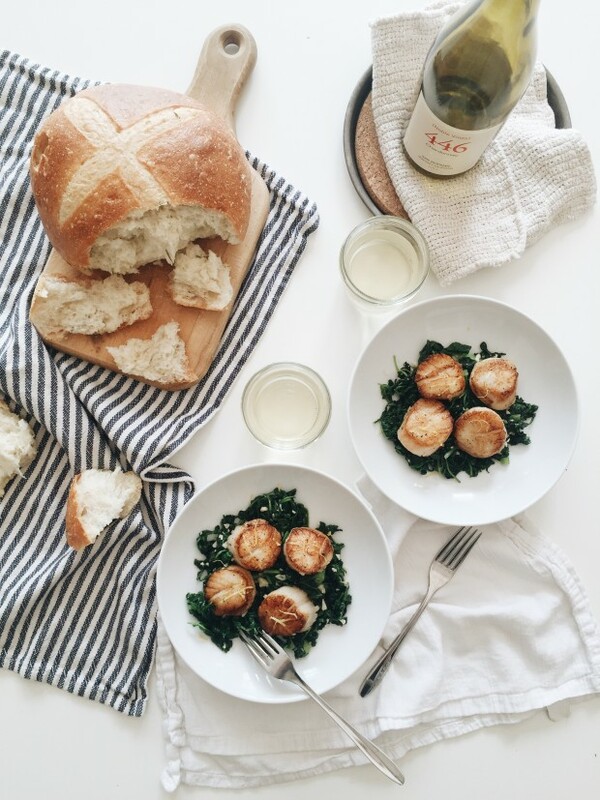 I love scallops and always keep it simple when I cook them. You did the same here and your presentation with the greens, bread and wine looks beautiful and delicious. 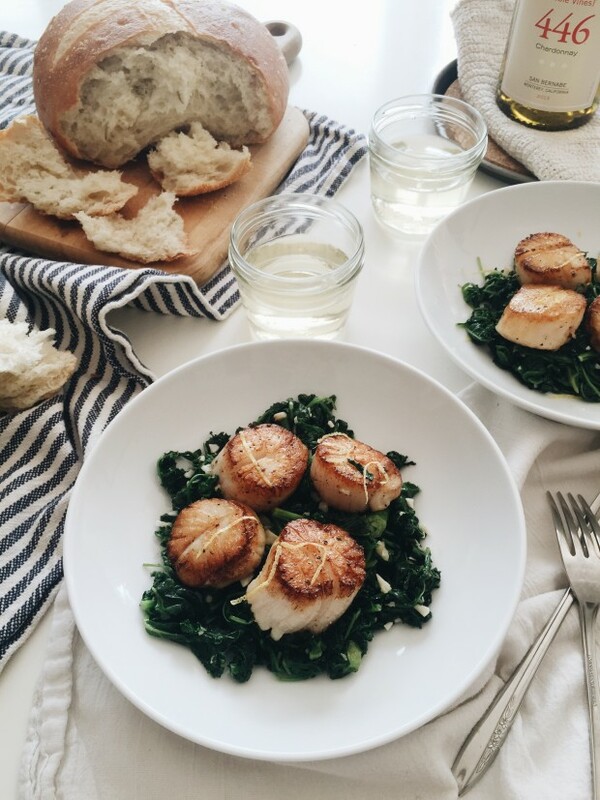 Scallops are definitely a 'less is more' kind of protein when it comes to prep and you nailed it. I've learned so much from my partnerships with wineries... I never really thought outside the box in terms of how I could use it in cooking (seemed like a waste when I could just pour it in my mouth), but it really does add such a wonderful, rich flavor to dishes. These scallops look marvelous. Never thought to do scallop tacos, but I'm totally on board. Those scallops look amazing! Very excited to try making them. The winter months always make me prefer red wines (despite the teeth stains!) and planning to have a Malbec with a mexican bean stew tonight :-) Thanks for the great wine pairing ideas! MALBEC is my absolute fave red! I have two bottles on the shelf right now. And mexican bean stew - are you kidding? I'm all over this. Ohhhhhh! Well, a really hot pan mainly. Let the oil heat up in the pan, then place the scallops in! And maybe, if you need to let them sit for a full two minutes, that's fine. It just means the other side will only need maybe 30 seconds. Good luck! I hope you try it again! Wonderful idea! I wonder would it taste good with a bottle of New Zealand Sauvignon Blanc? Can you come up with a tastier, more satisfying, more consensual dish than calamari fritti? asks restaurateur and Guardian columnist Yotam Ottolenghi in the paper today. Well, it s a tough call but his other mouthwatering recipes would certainly run it close. Ottolenghi s food is full of flavour and therefore quite a challenge for any accompanying wine but here s what I would choose.